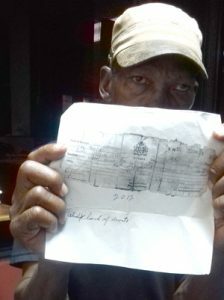 Six years after taking his hard-earned savings of $100,000 to bail a relative, pensioner Victor Walters says he is still waiting for his money to be refunded by the Georgetown Magistrates Court. The former security guard has carefully secured his receipt in the hope of getting his money back. But he says that he’s been given one repeated excuse as to why this cannot be done. Mr. Walters said his troubles started in 2012, when a relative of his was charged with armed robbery. A female relative pleaded with him to help post bail for the accused. According to Mr. Walters, he withdrew $100,000 from his bank account and gave the female relative. He collected a receipt, which showed that the money had been paid over to the court. “The lady keep telling me they had a flood and they can’t find the jacket, and when they find it they will call me. Last week, a staffer reassured Kaieteur News that she will look into the matter, and said that Mr. Walters should visit the department. Mr. Walters said that he hopes that the six-year run-around he has endured will end this week.